Cleaning for your interior compared with exterior care, is the difference between night and day. you'll need to arm your self with different products, tools and tricks to tackle the exclusive surfaces and areas of the interior there are three general areas of interior care: cleaning, protecting, and dressing. Neopol Interior Cleaner concentrate softens, condition, polishes and helps to resist, stains and water damage baring fresh clean fragrance. Neopol Interior Cleaner extremely effective on car interior like dash board, steering, wheel, leather or vinyl seat covers etc. Neopol Interior Cleaner is also used on leather and vinyl surface like bags, sofas, purses, briefcases and wallets. 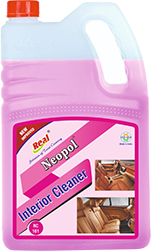 Neopol Interior Cleaner is also used as glass cleaning product. Dilute one part of interior cleaner in ten part of water in a bucket. Dip and squeeze on to a clean soft cloth or a damp cellulose sponge. Rub soiled and rusted area briskly, water is not required after rubbing the area of interior, than buff the area with another wet clean and soft cloth. For glass cleaning use one part of interior cleaner in twenty parts of water in spray bottle.